In this blog, I’ll cover how Taylor Swift used social media in a disruptive and innovative way and what marketers can learn from this approach. In anticipation of her upcoming album, Swift began to quietly pull the shades on her social media activity, until finally committing to discontinuing altogether. This act left many to question her lack of engagement as perhaps a temporary retreat from the spotlight. Even in the midst of a new boyfriend and a sexual assault lawsuit, Swift maintained her minimalist online presence. Until August 21st. 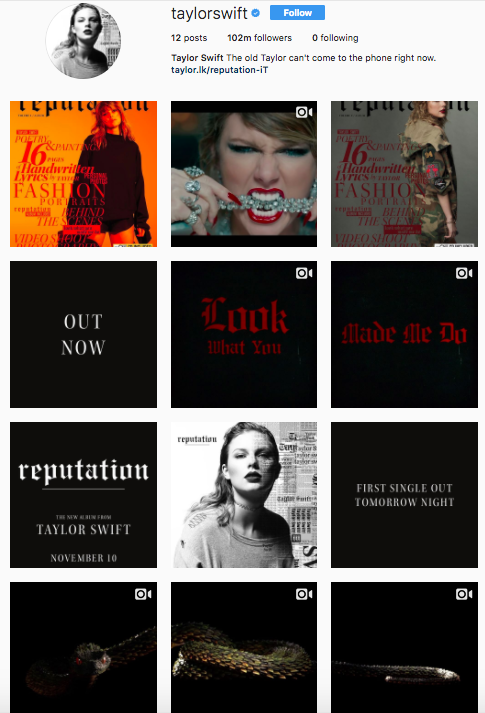 On that day, Swift graced her fans with the announcement of her new album, “Reputation,” via a string of coordinated posts across her Instagram, Twitter, and Facebook pages. 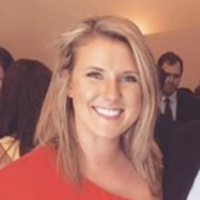 While major announcements are commonly released via social media, Swift adds her own twist to the popular promotional channel to garner a significant amount of unobstructed attention. In an unconventional move, she deleted all former posts, allowing her page to solely focus on her upcoming release. By deliberately deleting her social past, she was able to capture the attention of her fans and shift the focus toward her future. It is a blank canvas and a fresh new start, to reinvent the way her fans, and the media alike, view her brand. With this move, she guided us away from past projects and outside gossip while commanding our concentration. Her social media strategy directly aligns with the theme of her first release “Look What You Made Me Do.” In this song, half way through we can hear Taylor answer a phone and proclaim that the old Taylor can’t be reached because “she’s dead.” This line validates her social absence and erasure of memories. Now, it has been almost 11 years since Taylor debuted her first song “Our Song,” winning over the hearts of teenagers across the country. Teenagers who instantly related to her catchy first-love heartbreak ballads and girl next door familiarity. But as her fans aged in order to stay relevant, Swift’s brand had to continue to grow and evolve as well. She no longer caters to a fan base who is day dreaming about Prince Charming, but a more mature, more rebellious base who create their own fairy tales. Her fans no longer want to see her as a sweet, curly haired country crossover who tells them ‘shake it off’ when critics’ chatter becomes deafening. They demand a role model who boldly stands up to her critics and sets a brave precedent for future engagement. And with one of the most popular songs on the radio, when Taylor stands up to her detractors, she ends up being the one getting the last laugh—all the way to the bank. While most brands will be unwilling to adopt this same type of marketing strategy, Taylor’s unique approach to social media reinvention gives her the ability to take control of her brand’s narrative and re-establish her relevancy to her loyal fan base. Even as one of the most successful and popular music artists of our generation, she doesn’t rest on her past success to continuously propel her future endeavors. She puts herself in the driver seat of her brand and lets us know that we are along for the ride. As marketers, we can embrace her strategy by continuously pushing social media norms and always keep a finger on the pulse of our customers. Today’s customers demand a marketing strategy that cuts through the traditional babble and creates an experience that rises above the noise and speaks to them on an individual level. Even industry leaders can embrace a marketing plan that goes beyond content calendars and organized social strategy and delivers an exceptional and fresh customer experience. As marketers, we cannot continue to play it safe, or our efforts will always fall short, being buried under past publicity. We must take the wheel and drive our brands narrative, guide our customer’s attention, and create an experience unmatched by our competitors. Whether you love her, hate her, or don’t even know who she is, Taylor Swift’s marketing savvy is something of note. What can you take from her strategy to apply to your brand? What wouldn’t work for your company? We’d love to hear about how this applies to you and your company! Or share any lessons that you’ve gleaned from pop culture and incorporated into your marketing in the comments below.